God Meets Ball: Does the NFL Teach us Grace? Or Economic Pragmatism? 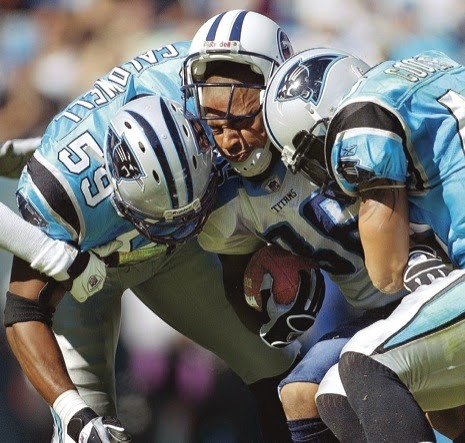 Does the NFL Teach us Grace? Or Economic Pragmatism? "The NFL is not a contact sport. It's a collision sport." I heard this statement on the radio the other day. It feeds into the image of American football players warriors or gladiators. They routinely put their bodies on the line for the benefit of their team. We now know that many of these collisions result in long-term conditions such as dementia and other mental illnesses. But still, young men line up for a chance at glory in the NFL. Yet this image of fierce warriors takes a bit of a hit in light of some recent demonstrations of grace within the ranks of the NFL. 1. In 2012 Josh Brent was the drunk driver in an accident that killed his teammate and best friend, Jerry Brown. This week Brent was reinstated to the Dallas Cowboys roster after serving 180 days in jail and serving a 10 week NFL suspension. This seems to demonstrate a tremendous degree of grace toward Brent. I imagine many churches would struggle to welcome back someone responsible for the death of another church member. 2. This one's tricky. On August 31, 49ers player, Ray McDonald, was arrested on suspicion of domestic violence toward his pregnant fiancee. This was just weeks after Ray Rice was suspended indefinitely for striking his fiancee. There was no video of the incident. So while many public commentators demanded that he be suspended, the 49ers stood by him and insisted he had a right to due process. On first glance this seems like a very gracious approach by the 49ers. The easy thing to do here would be to go with the groundswell of popular opinion and suspend McDonald regardless of the facts. Instead they bore the blast of public criticism to give him a "fair go". 3. Adrian Peterson made headlines earlier this year when he was arrested for abusing his 4yo son. He had "whooped" him with a switch to the extent that the child required medical attention. No doubt, this type of discipline was familiar to Peterson from his own upbringing, but many people considered this degree of violence against a 4 year old as inexcusable. Last week Peterson reached a plea deal in which he denied guilt but accepted probation, a fine, and agreed to attend parenting classes and complete community service. As the path clears for Peterson to return to the NFL (he's been suspended with pay since the story broke) many fans will have trouble cheering for him. Yet his teammates will apparently be happy to welcome him back. They're willing to extend him greater grace than many fans and commentators will. So, should we hold these fierce gladiators up as big softies and shining examples of Godly grace in a world of suspicion and resentment? There's always the other side of the coin. There's a very high likelihood that these displays of grace may be motivated more by economic pragmatism and the on-field needs of the teams involved. The Dallas Cowboys could use another big body on their defensive line as they make a run at the playoffs. I said this was tricky. McDonalds "incident" apparently left his fiancee with visible injuries. (Read the last paragraph of this article.) Also a significant factor in the charges being dropped was the victim's unwillingness to cooperate with the police investigation. This is common in situations of domestic abuse and can be more indicative of the abusive relationship than the offenders innocence. The 49ers had a lot of other injuries and suspensions this year so they had good reason, from a performance perspective, to keep McDonald on the field. Peterson has been the outstanding running back in the NFL for the past few years. There's no doubt that if he's fully fit he'll make a huge difference to the Vikings performance. When players are committed to winning they'll often accept anyone they think will help the team, whether they like them or not. I don't know that we can determine a correct answer to this question without being present in each situation. In the meantime, our own situations will most likely influence how we view each of these cases. If there's no other teaching point from this post, there's this: Grace is messy. (and NFL player may be big softies.) But I do think these cases give us a great opportunity to ask the question, "Does the NFL practice grace more readily than the church does?" You'll be closer to an answer. What these women say is sad yet not at all surprising. What is sadder is more people of influence are not taking their stories seriously. Power differential much?